Frequency is a nicely played out thriller for a comfortable couch and a bottle of wine. 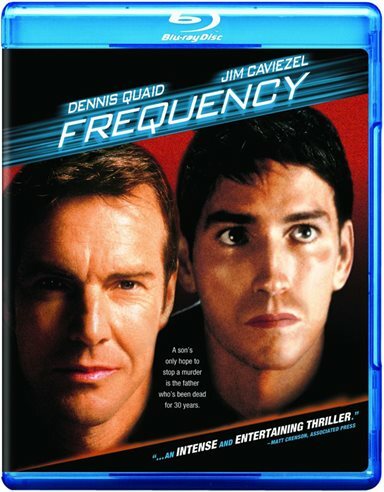 Now out on Blu-ray for the first time Frequency, an exciting and intriguing film with a lot of twists, gives home video consumers a chance to see the film upgraded for digital televisions. Loaded with special features that include commentaries by the filmmakers, the added treat makes the experience even better. Being a Sci-fi enthusiast, movies like Frequency are scrutinized a bit closer for the chill factor that makes an audience act with surprise when they recognize the eerie or are amazed. It's been twelve years since the release of this film and filmmaking has changed quite a lot during that time period with the use of CGI and other special effects, so the story becomes the main characteristic that gets most of the analysis here. The film involves police officer John Sullivan (Jim Caviezel) who finds a strange communication to the past due to an atmospheric anomaly that connects him to his deceased father Frank (Denis Quaid) who died some 30 years ago while fighting a fire. When John tells his dad how he will be killed the information saves his life. But, when this changes in the order of things, the future starts to become altered creating a series of events that involves an impending murder. The idea here makes the film incredibly fascinating and compelling. With the clock running, Frank can save his own life and that of the victim of a killer. It's a race for time that puts Frank in a delicate position of explaining how he knows it's going to happen. Director Gregory Hoblit (Primal Fear, Heart's War) does an excellent job of making the film surprising with a sense of urgency. Using his fine talent he inserts many twists and turns in both time dimensions so you never know when they are coming. His ability to control the two time periods with things in the future affecting the past and vise versa, make the film fun to watch. Frequency is Elizabeth Mitchell's (Running Scared) first major role in a film. She plays Jules Sullivan, alongside Denis Quaid in the movie. Michael Cera (Superbad) makes his motion picture debut as 10-year-old Gordy Jr.
Download Frequency from the iTunes Store in Digial HD. For more information about Frequency visit the FlickDirect Movie Database.